As the battle for the leading opposition PDP presidential candidate hots up, some things have become obvious. The weak aspirants are known, the top men are also known. The party's Governors are not ready to give room for a "weak" aspirant to emerge. Who among the influential men will emerge winner? The stage is set for Saturday’s PDP presidential convention in Port Harcourt, Rivers State. The 12 aspirants are outdoing one another to clinch the ticket to fly the party’s flag during the presidential election next year. The Nation's Bisi Olaniyi writes on the minimum standard some of the aspirants and delegates expect from the historic event. The die is cast. The turf is the Adokiye Amiesimaka Stadium in the state capital. 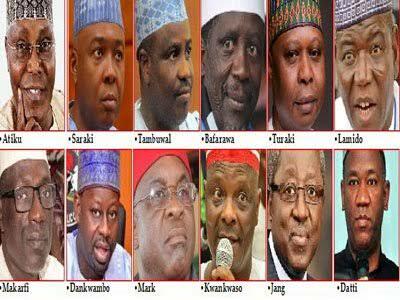 Locking horns are 12 presidential aspirants under the umbrella of the PDP. At stake is the opposition party’s presidential ticket. 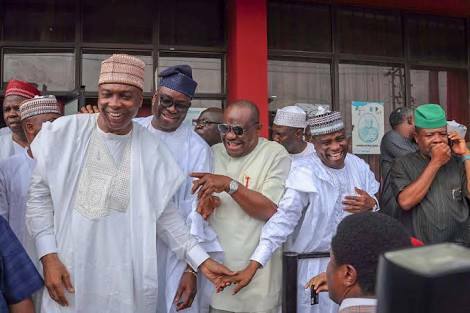 In the race are former Vice President Atiku Abubakar; Senate President Bukola Saraki; Governors Aminu Tambuwal (Sokoto); Ibrahim Dankwambo (Gombe); formers governors Rabiu Kwankwaso (Kano); Ahmed Makarfi (Kaduna); Sule Lamido (Jigawa) and Attahiru Bafarawa (Sokoto); Jonah Jang (Plateau), former Senate President David Mark; Datti Baba-Ahmed and former Special Duties Minister Tanimu Turaki. Some of the aspirants have been expressing optimism that they will be victorious at the convention. They have traveresed the country to present their programmes and plans for the country if given the mandate to lead the opposition party. The PDP, which lost power to the APC at the central in 2015 after 16 unbroken years, had appologised to Nigerians and pleaded that it be given another chance. It has been critical of the ruling party, especially in the areas of the the economy and the anti-corruption battle, which it alleged is targetted at opposition forces. Many of its members are facing trial over alleged misdeeds during the 16-year reign of the PDP between 1999 and 2015. Port Harcourt – the Garden City and capital of the Southsouth state, was agog last night for the convention, at which the President Muhammadu Buhari’s main challenger will emerge. The APC will also tomorrow hold its national convention to affirm Buhari as its candidate in the presidential poll. Moving round the city and its environs yesterday, The Nation observed that the billboards, banners and posters of Abubakar; Kwankwaso; Tambuwal Saraki were jostling for space. The venue was wearing a new look, with the presidential aspirants having their banners, posters and billboards conspicuously placed for attention. Artisans were seen busy at the stadium, painting, decorating and mounting Public Address System (PAS) to ensure a successful convention. The Convention Planning Committee Chairman and Delta State Governor Dr. Ifeanyi Okowa reportedly adjudged the stadium as befitting for the historic event. Hotels in the city and neighouring communities were being fully booked by aspirants’ representatives, observers, local and foreign reporters, as well as PDP stakeholders. Delegates from the 36 states and Abuja were trooping into the city through the airport and the inter-state roads. The state capital was also wearing a new look with repainted roundabouts, junctions and strategic points. Street sweepers and sanitation officials have been mobilised to work extra hours to keep the city clean. Resident newsmen were battling with accreditation for coverage of the event, being coordinated by the PDP National Publicity Secretary, Kola Ologbondiyan, with the support of two members of the Publicity Sub-Committee: Simeon Nwakaudu, the Special Assistant to Governor Nyesom Wike on Electronic Media and Oraye St. Franklyn, the Special Assistant to Rivers Governor on Social Media. Recall that Governor Wike had kicked against those pushing for shift of venue from Port Harcourt, branding such peoples as enemies of the state. According to him, such a big event would boost the economy of the state. This platform gathered that party leaders are meeting again to see how they could reduce the number of contestants in the next few hours, especially since the top contenders are now known. Some so called weak candidates will likely endorse two top aspirants openly, thus setting the stage for an epic battle.